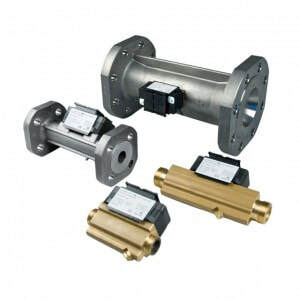 The Ultraflow 54 is a static flow sensor based on the ultrasonic measuring principle. It is primarily used as a volume flow sensor recommended for use with the MULTICAL calculators (Multical 602/402/403) and has been designed for heating and cooling applications where water is the heat-bearing medium. Using a bi-directional ultrasonic technique for measuring the volume, this sensor has proven long-term stability and accuracy. The Ultraflow 54 is marked by its longevity and its exceptional accuracy. It has a compact design and no moving parts, which makes it resistant to particles and impure water.